"We enjoyed our stay very much, and have already booked to return next year. "This was my first trip across the pond with my husband and Sandford Country Cottages made it so magical for us. Set in the countryside, we were able to relax after a day of exploring. Evelyn had the cottage ready with a greeting gift when we arrived. She has information on the history of Sandford Cottages and lots of info on things to do in Scotland. Sandford Cottages is centrally located and was a perfect place for us to have our base. We had a 5 day break in our stay and were able to return to the Cottage and leave our excess luggage at Baillie Scott while we explored Ireland. Walks in the fields behind Baillie Scott were amazing! One night we watched the sunset from up high. Any questions we had were answered by Evelyn promptly. You feel like family when staying at Sandford Country Cottages, I feel like I have a home to come to when I return to Scotland! Thank you Evelyn and Ralph"
"A fantastic long weekend for our wedding anniversary with dog in tow. Lovely welcome from Evelyn with a very nice welcome basket in the cottage. Beautiful cottage with views of the countryside, a real home from home. A huge thank you to Evelyn and Ralph for kindly driving us to the Peat Inn and arranging a taxi home for us. Will definitely be looking to visit again." "A wonderful stay in The Giddy Limit at Sandford Country Cottages. We would definitely recommend the accommodation - 5 star in every aspect. Fabulous location and beautiful surroundings." 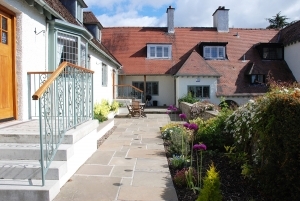 "Anyone looking for a short break in Fife would be well advised to consider Sandford Cottages. The cottages are internally finished and furnished to a very high standard to provide an extremely comfortable and cosy "home from home". Valentines Cottage, where my family stayed, was perfect for our needs. The property is well situated for exploring Fife and is also a short drive north across the bridge to Dundee and the countryside beyond. The owners, Ralph and Evelyn, made us feel very welcome and the restoration work they have undertaken on what was a tired and deteriorating former house then hotel is a testament to their vision and energy." "Sandford is a wonderful place to stay. Just a few miles from St Andrews so there is a lot of attractions including fantastic walks. The cottage was beautiful - clean fresh and tastefully decorated. The owners really looked after us and even put up Christmas decorations including a gorgeous Christmas tree in the courtyard below. It was a great place for our Christmas break and we cannot praise it highly enough". "Couldn't have been more perfect. Accommodation absolutely beautiful, clean, spacious & well- equipped. Evelyn a brilliant host who looked after us from start to finish. Have stayed around this area many times in different places and this just has to be the best. Can't wait to return"
"Stayed here with two other work colleagues for a week. The accommodation and location was stunning and the welcome we got was second to none. Was that impressed that I would love to return with the family for a break. Can't recommend highly enough". "We can't recommend this cottage highly enough. Everything was perfect. Beautiful accommodation, attention to detail in everything. The perfect hosts in Evelyn & Ralph, who have made a fantastic job of the renovations (they even gave us a tour of their beautiful Arts and Crafts house). Fantastic place, lovely people, we will definitely be back".